The Reconciliation of All Things: Pistol Puppy, this is my toy! 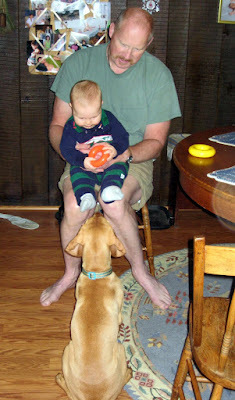 Caleb enjoyed playing with Pistol who is a 6 month old Vizsla puppy. Pistol wanted to kiss his face whenever possible and she loved stealing his bibs and hiding them. she is so adorable and tons of energy. Nothing like vizsla kisses to make you giggle.